For a limited time only, you can try a fully functioning 30-day trial license of Kinetic Inventory Management (KIM) for osCommerce. Our free trial gives you the opportunity to see very quickly how much time and money you can save by reducing your hands-on inventory management time. Installation is extremely easy. We will provide you with instructions on how to upload the files to your server via FTP, or if you would like, we can install the KIM software for you for $50.00 USD. There are only two osCommerce source code files that need to be slightly modified to add the menu items to your store's admin panel. All you need to do to install the source code files is copy them to your store's admin folder. We also provide a self-executing installation script that automatically adds several database tables. We will also provide tech support to you throughout your 30-day trial period so you can be sure to quickly understand how to put this powerful and easy-to-use software to work for you performing all of your company's inventory management tasks. We are confident that long before the conclusion of your trial period you will be already realizing tremendous savings of time and money. In many cases, the software will have already paid for itself by this time. When you purchase your full retail license of Kinetic Inventory Management for just $850.00 USD through our online store, we provide you with the same version of the program that you installed for your trial period. The only difference is that you will then have a permanent non-expiring license that is encoded to work on your e-commerce store's domain name or URL with one year's worth of free updates and technical support for your KIM software. All you need to do to start your FREE 30-day trial today is contact us by e-mail or phone at 615-451-0107. A customer support representative will assist you right away and will be happy to answer any questions you have. Call us today to see how easily you can perform all of your inventory tasks, like creating and receiving purchase orders, improving inventory turnover, managing back orders, and tracking sales. 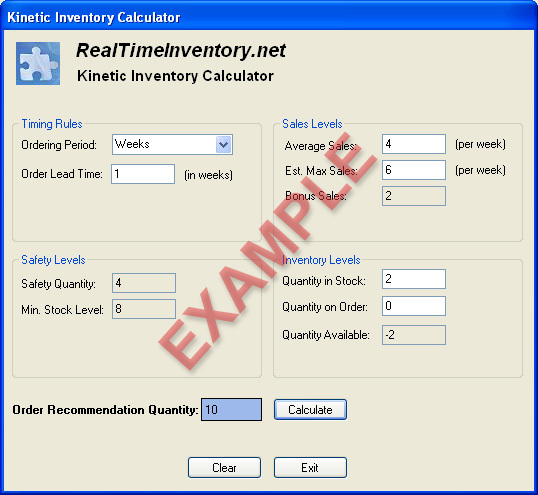 A free inventory management application called the Kinetic Inventory Calculator is now available for download below. This free inventory calculator allows you to enter the quantity of an item on hand, the average sales, the quantity of the item currently ordered, estimated maximum sales, and the manufacturer's lead time. The calculator will then determine if you need to order inventory at this time, and if so, how much. The method of calculation that this program uses is exactly the same as our full Kinetic Inventory Management package. This free inventory program, however, is designed to be used for analyzing one item at a time. Running some of your real numbers using this free inventory software will give you a good feel for how the full commercial package can help you optimize your inventory levels and achieve your ideal inventory turnover. Click Here to download the Windows version of the Kinetic Inventory Calculator (without installer) . Click Here to download the Windows version of the Kinetic Inventory Calculator (with installer) .